There is no shortage of nutrition advice for people with diabetes. From the internet, friends, family, health care providers and even celebrities—everyone has advice on what to eat to be healthy. But what’s usually missing from the conversation is how. Even if science managed to figure out the “perfect diet” for all humans, that doesn’t mean we would all start eating that way overnight. Why? Because what we choose to eat is influenced by a ton of factors. During National Nutrition Month, we asked people what factors influence their food choices. Here, we examine the results and discuss why eating healthy is so complicated. What factors influence your food choices every day? Choosing what to eat may seem straightforward —you do it several times a day after all—but there are hundreds of decisions that we must make every day that shape our food choices. Think about this: What are you going to eat for dinner tonight? There are probably dozens of questions you have to ask yourself before ultimately deciding what you’ll have for dinner. The truth is, deciding what to eat is incredibly complicated and there are tons of factors that influence our food choices, like time, health, cost, personal preferences, religious or ethical restrictions, medical restrictions, convenience, cooking skills, etc, etc, etc! And everyone prioritizes those factors differently. If you’re managing a disease, health might be the most important factor to you. If you’re on a tight budget, cost might be the biggest influence. If you’re strapped for time, you might prioritize things that are convenient, quick, and easy. Some people also have limited control over their food choices, either because they are preparing foods for someone else, or because someone else is preparing food for them. You get the idea! 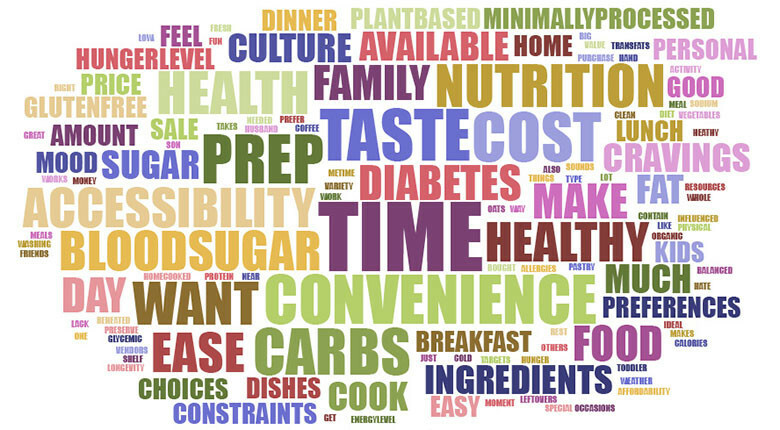 To get a better idea of the factors that effect people’s food choices, we asked staff at the American Diabetes Association and our constituents on social media: “What factors influence your foods choices every day?” We created a word cloud with the responses to visualize which responses were most common. The larger a word is in the cloud, the more times that word showed up in people’s responses. Incorporating some prepared ingredients, such as a cooked rotisserie chicken from the grocery store, for “semi-homemade” cooking. How to meal prep and get the most out of the limited time you do have to cook at home. Making healthier choices at fast food restaurants or other convenience options. Health seems to be the next most important factor, with people looking for options that are healthy, or that will help them manage blood sugar or other health concerns. For the health-conscious folks, recommendations should be based on individualized health goals. Most likely, people may be balancing more than one health concern, making an individualized plan even more important. A general, healthy diet full of nutritious vegetables, fruits, whole grains, healthy fats, and lean protein is a great starting point. Also prominent in the cloud is personal preferences, indicated by “taste,” “cravings,” “wants,” and “culture.” Eating is an integral part of living, and for many people, food is tied to family, culture, comfort, and joy. An overly restrictive diet may be a fast track to optimal health outcomes, but if it is unpleasant or too far from what a person normally enjoys, sticking to such a diet will be difficult over time. As you can see, there are several factors that influence an individual’s food choices, many of which are hard to control or change. In reality, most of us are balancing several of these factors every day. Remember, eating is personal, and what works great for one person may not work for you! The real key to healthy eating is identifying what works for you and your priorities.